Passionate--formerly Moderate--now Liberal "Mormon": Holland Saves Western Europe! The Red, White, and Blue, and Orange! Ziko-C - Own work. Kerktoren Oude St Mauritius, Silvolde, Koninginnedag 2008. Toren uit ca. 1570. Not that I'm a big expert on internal or external Dutch politics, but the weak election results of the Partij voor de Vrijheid - PVV (Party for "Freedom") of yet another nationalist populist who shall remain unnamed on this blog was a good sign yesterday. It shows that the march of nationalism that resulted in so many millions of deaths in the horrific wars of the 20th Century may be turning a corner in 21st. A friend an I discussed the cycles of history yesterday and how we fail to learn to stand up for the rights of the oppressed. The struggle keeps cycling around but blood and horror always seems to rule on this earth. Before the nationalistic wars of the 19th Centuries, we had the nations battling over colonies and slavery and the oppression of peoples of different cultures and tones of skin color. Before that were the feudal kingdoms of "might makes right" and he who had the most gold or bigger sword lorded it over the serfs, peons, or peasants. But back to the plucky Dutch (I have some ancestry there, by the way, on both my Dad and Mom's side. 19th Century Mormon converts on my Dad's and back to Colonial New Amsterdam Dutch on my Mom's). In the 20th Century, the Netherlands were rolled over by the Nazi war machine surrendering but never quite as their resistance was strong. Many helped Jews escape to neutral Sweden. The resistance wore the hidden safety pins to flash their unity that have now become a symbol of support of immigrants and refugees in this country as I wear them. After the war, Mormon Dutch gathered their potato harvest to feed the starving survivors in . . . Germany. It was such a relief to see their rejection of nationalism yesterday. And in related good news, a U.S. Court in Hawaii halted trump's latest travel ban on people from certain Muslim countries. It was inevitable and ironic. The State of President Obama's birth making him eligible to be President, a State that prides itself on a true mix of cultures in a laid back sort of way, issued this defeat using the words of trump and his staff to reveal the same directed animus and discriminatory intent towards the religion of Islam that was the basis for the first ban, technical finessing notwithstanding. It was trump who led the birther charge against President Obama without evidence except for the clearly evident and similar animus and discriminatory intent. Western Civilization is in crisis. And it will only be saved by moral, religious principles. However, these are the principles of the Golden Rule found not only in Western Christianity but in Eastern religious traditions too. And even in Islam if we look for it and allow it to flourish by our own good examples. Thank you, Holland! 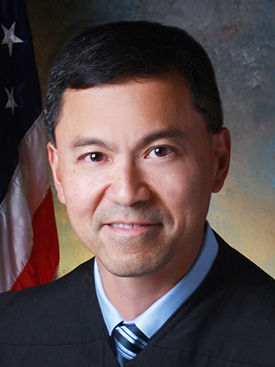 And thank you U.S. District Court Judge, the Honorable Derrick K. Watson, District of Hawaii! Yes, we should know your name. The Constitution Is NOT A "Negative" Document!